In February, 2013, the Lay's and a comedian Martin Short announced there'd be a flavor contest called "Do us a flavour!" and asked all the Canadians to vote their flavor ideas and the winner would receive 50,000 Canadian dollars besides 1% of future sales. Lay's received more than 600,000 ideas and chose 4 flavors for the finalists; Creamy Garlic Caesar, Grilled Cheese & Ketchup, Perogy Platter and Maple Moose. These 4 flavors were sold to compete to get votes from July 30 until October 16. 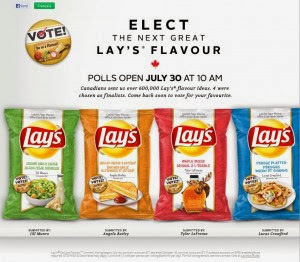 Nationwide Canadians attended the votes and the sales were more than the Lay's had imagined as the media and SNS were supporting this contest. Even these 4 flavors got attention of the neighbor country, the United States. On October 22, 2013, they announced Maple Moose was the winner of the flavor contest among the 4 finalists. I haven't tried all the final selections, but here's my thought. Creamy Garlic Caesar: It's not hard to think of the flavor and it must taste good as if it's sour cream with some spices. Grilled Cheese & Ketchup: I love Grilled Cheese but never thought of having it with any single drop of ketchup... Does is really taste good? Isn't the ketchup gonna ruin the great flavor of cheese, butter and bread? This might taste salty and have some sweet-sour tomato taste besides cheese flavor. Perogy Platter: I looked up the word "perogy" in several dictionaries but no definition came up for the word or I should say there's no such word. When I researched, "pierogi" appeared on Wikipedia and it's a Polish dumpling. This is my first time to hear about the dish and see the images with description of the fillings. It seems like it's a potato gratin wrapped in a thin dough as the popular ingredients are ground meat, mashed potato, cheese, and/mushrooms. They either mix or use single ingredient for the filling. I haven't tried the chips yet but this is what I thought before I opened the bag. Maple Moose: They say that maple syrup is one of the popular seasonings in Canada and they use it for sausage, mashed potato besides pancake, the last of which is pretty normal for everyone who doesn't live or grow up in Canada. Regarding "moose" part, I don't know if this one has some meat flavor in it. If it does, I wonder what moose would taste and smell like. It says "Limited Time Flavor" due to the period of this product was sold and meant to be a tool for the vote, but Lay's will relaunch late in November since this is the winner of the competition. *As it's available in Canada, there're English and French on the package. At the front center, there's a name and his resident area of the person who suggested this flavor. And at the bottom, there's a Moose with a jar of maple syrup. On the back, there's a photo of Mr. Tyler LeFrense who submitted the flavor idea. And below, there're other 3 candidates and a advertising lines to get consumers involved in the "Do us a flavour!" contest. Now, time to try the chips. To my surprise, it didn't have any maple flavor when I opened the bag!! I see black dots on the chips. It smelled some sort of meat similar to beef. When I ate this, I thought it'd be sweet but I didn't taste any maple syrup but spiced beef. It was like beef jerky and subtle BBQ flavored potato chips with black peppers and impossible-to-notice flavor/taste of maple syrup. I only had one, literally one chip, but when I breathe normally (inhale and exhale via nose), I can still smell the scent. Among the 4 flavors, is it the really winning flavor? It's not bad yet not my favorite.